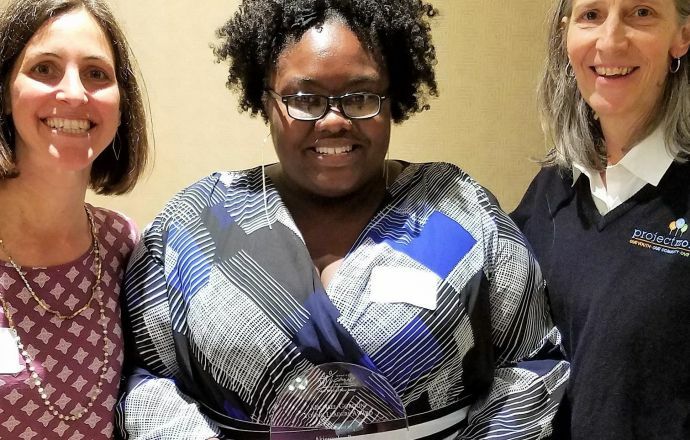 On 10/25, Project Morry’s Undergrad and Post Grad 3 Girls Coordinator, Akienyalay Bruce received the Michael Gordon Young Leaders Award at the 2017 American Camping Association’s Morry Stein Camp Conference. This award is given to an individual who is making an impact on the camp profession through their leadership and service. Akay began her career with Project Morry as summer counselor in 2010 and became a member of the full time program team in 2015. In her role as the Under Grad and Post Grad 3 Girls Coordinaor, she is responsible for creating curriculum, facilitating school year meetings, and providing on going engagement of students, parents, and community partners to ensure the emotional and academic success of Project Morry at a critical time in young women’s lives. In addition to her work at Project Morry, Akay has co-chaired the Non-Profit Camp Conference for the past 3 years and been a member of the Inclusion Track Program Committee for the ACA’s Tri-State Conference. In all of these roles, she has brought issues of social justice and racial equity that impact Project Morry students and families to the forefront. These include the targeted ways girls of color are disciplined at school, the school to prison pipeline, and empowering children of color with a sense of positive self identity and self advocacy to envision and achieve their goals. Akay is a tremendous role model and colleague in the fields of both youth development and camping. Project Morry is proud of her achievement and to have her on our team. Congratulations Akay!